Design: Rhys Tranter. Photograph: Getty Images. Despite its frequent alignment with an aesthetic of ‘lessness’, Samuel Beckett’s work has remained insistently, even hyperactively, productive for literary studies. No longer bifurcated between existentialist humanist and ‘theoretical’ approaches, over the past decade and a half Beckett Studies has found itself both leading and vigorously responding to new critical agendas. Critics have found Beckett’s published work, and the ‘grey canon’ of manuscripts, notebooks, and letters that now sits alongside it, remarkably accommodating terrain for exploring and mapping the empiricist, archival, and historicist critical modes that now dominate modernist studies. At the same time, Beckett has remained persistently important for those pursuing the relationships between literature, philosophy and ‘theory’. Other approaches, such as those drawn from medical humanities, postcolonial studies, digital humanities, queer theory, cognitive literary studies, and the interdisciplinary study of literature and art, have frequently found themselves drawn to Beckett as a rich and enduringly authoritative test case. At the inaugural meeting of the London Beckett Seminar in 1998, Steven Connor spoke about ‘Doing Beckett Studies Against the Grain’. 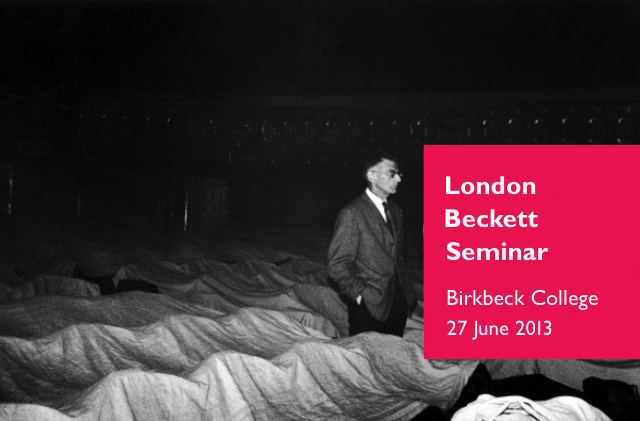 Now, nearly 15 years on, current and former members of the seminar are meeting to consider the state of Beckett Studies, ‘tracing the grain’ of the discipline, outlining the particular contribution of the London Beckett Seminar, and working to frame what might be the most significant critical questions that emerge when Beckett is read. An afternoon of short talks and discussion will be organized around the themes of ‘Why Beckett?’ and ‘After the Fact’. All are welcome to attend this free event and contribute to what we hope will be a lively and productive debate.